Somewhere in Chico, CA, Aaron Rodgers is smiling. 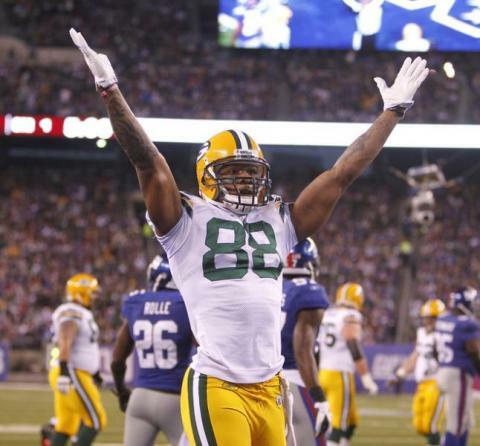 Jermichael Finley signed a two-year, $14M contract tonight – good for the fourth-most average per year money by a TE. The deal is a compromise between the two sides on two fronts: (1) it essentially splits the difference between the franchise numbers for TE and WR (remember, Team JMike was prepared to argue his franchise number should be a WR based on where he lines up – for the record, JMike lined up as a WR a little less than half the snaps last season (which means he may have had a winning argument because he also lined up in the backfield on occasion too)); and (2) the Packers get to wait a few more seasons to determine if JMike is an essential player to keep around under a long-term deal, and the flip-side, of course, is JMike hits free agency again at age 26 and will look to cash in. Packers fans out there should be very excited about this new deal. Undoubtedly, JMike is the enigma of the Packers. He’s brash, outspoken, and the only showy-type receiver on the squad. Hell, he has his own personal motto for his TD celebration – YOTTO (Year Of The Take-Over). But, he’s also the Packers most physically gifted receiver, a matchup nightmare, and has all the potential in the world. But therein lies the problem. He has all this talent and potential, but hasn’t exactly put it together in a season yet. The closest we came to seeing his potential dominance was at the end of his second year, in particular the Arizona Cardinals videogame-like playoff game. Remember this (go to 2:49 mark to see exactly what I’m talking about. I mean, he posterized Bryant McFadden like Vinsanity did to ‘Zo Mourning back in the day!) JMike carried it over to the start of the 2010 season where he had 300+ yards in 4 starts, including a huge performance at Chicago on MNF – 9 catches for 115 yards. JMike was Rodgers’ favorite target and really leading the offense. Then, pop goes the ACL. Since that time, JMike has not returned to his pre-injury self, as far as the stats go. Last season, JMike put up a 55/767/8 stat line, good for 15th, 12th, and 3rd in the league for TE’s. When you add in the number of drops he had, it was clearly just an OK season by a player that had a mountain of expectation on him. But, I truly believe that his value to the team goes far beyond these stats suggest. The 2011 Packers offense was the best in franchise history and single-handedly led the Packers to the best regular season record by putting up Tecmo Bowl numbers. JMike offered a tremendous amount of flexibility and creativity to the offense. At various times during the season, JMike lined up as an in-line TE, slot WR, split-end WR, and in the backfield as a FB or RB. Such creativity permits the Packers offense to dictate the match-ups they get from the defense. Along those lines, it’s naive to think JMike’s presence didn’t permit Jordy to break out like he did. Now, before you send me hate mail about this last comment, know that I am not saying JMike’s presence is the only reason Jordy established himself as a legitimate no. 2 WR. What I am saying, though, is Jordy benefits greatly from JMike drawing so much attention. Part of the reason everyone was so dumbfounded teams didn’t double-team Jordy, even though he was becoming a breakout, fringe Pro-Bowler, is because teams picked their poison in making sure JMike and Jennings didn’t kill them. Any quote you read from opposing scouts, defensive coordinators, or their water boys will uniformly say that JMike is a player they have to account for when lining up against the Packers. Tonight is a good night in Packers nation. Despite some negative opinions out there about JMike, he is a hard-worker and should bounce-back after a down 2011 season. I, for one, anticipate 2012 being The New YOTTO. This entry was posted in Vikes v. Pack and tagged 2009 playoffs, Aaron Rodgers, Andrew Quarles, Bryant McFadden, D.J. Williams, Finley contract, Franchise Tag, Green Bay Packers, Heisman, Jermichael Finley, Jimmy Graham, JMike, JMike contract, John Mackey, Jordy Nelson, New contract, New YOTTO, NFL, Packers, Packers nation, Rashaan Salaam, Rob Gronkowski, Ron Dayne, The New YOTTO, Vernon Davis, YOTTO. Bookmark the permalink.